THE PURPOSE OF THE FOOT TREATMENT IS FOR THE RELAXATION OF THE FEET AND TO PROVIDE THE BODY WITH AN OVERALL SENSE OF WELL BEING. IN ACCORDANCE WITH TEXAS LAW, REFLEXOLOGY CANNOT BE USED TO DIAGNOSE OR TREAT ANY MEDICAL CONDITION. 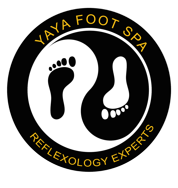 REFLEXOLOGY PROVIDED AT YAYA FOOT SPA® IS ONLY FOR RELAXATION, AND IS NOT TO REPLACE TREATMENT OR THERAPY. ANY MEDICAL CONDITION MUST BE EVALUATED BY A MEDICAL DOCTOR. REFLEXOLOGY CANNOT REPLACE MASSAGE THERAPY. THERE IS NO AGE LIMIT TO RECEIVING A FOOT TREATMENT BUT PARENTS MUST MAINTAIN CONTROL OF ANY MINOR VISITING YAYA FOOT SPA AND BE 100% RESPONSIBLE FOR THEIR ACTIONS AND WELL BEING AS SPECIALISTS ARE INVOLVED IN THE GIVING OF TREATMENTS ONLY. EVERYONE REACTS DIFFERENTLY TO THE DEGREE OF PRESSURE BEING APPLIED TO THEIR FEET. WHILE YOUR TREATMENT SHOULD BE FIRM, IT SHOULD NOT BE PAINFUL IN ANY WAY. PLEASE STOP YOUR TREATMENT IMMEDIATELY AND HAVE THE PRESSURE ADJUSTED UNTIL IT FEELS FIRM. MOST OF OUR STAFF DOES NOT SPEAK ENGLISH AND IT IS IMPORTANT THAT EACH CLIENT EVALUATE FOR THEMSELVES WHETHER FOOT REFLEXOLOGY IS APPROPRIATE. ALL CLIENTS ARE ADVISED TO CHECK WITH THEIR MEDICAL DOCTOR PRIOR TO A TREATMENT SHOULD THERE BE ANY DOUBTS OR QUESTIONS ABOUT FOOT REFLEXOLOGY. IT IS ESPECIALLY IMPORTANT WOMAN THAT IS PREGNANT CHECK WITH THEIR MEDICAL DOCTOR BEFORE A TREATMENT AND LET THE STAFF KNOW IN ADVANCE THAT YOU ARE PREGNANT. OUR GOAL AT YAYA FOOT SPA® IS TO MAKE YOU LEAVE FEELING 100% REFRESHED.